Geometric accents are a great way to bring depth and character into your décor. Geometric patterns are a clever way to add a visual appeal to your home décor with a pop of modern design and have come a long way since. Geometric patterns give a symmetrical vibe to your space. There has been a marquee shift from those busy patterns or florals to well-balanced and consistent accents. Using geometric patterns for your upholstery and drapery is a great way to introduce this element into your home décor. From making the space look larger to rejuvenating it with an infusion of style, your soft-furnishings can really transform the look and feel of a space. “If you are looking for a single stand-out element, try introducing a large detailed pattern in a bold fabric that really draws the eye, like Chrysler from our Madison collection. 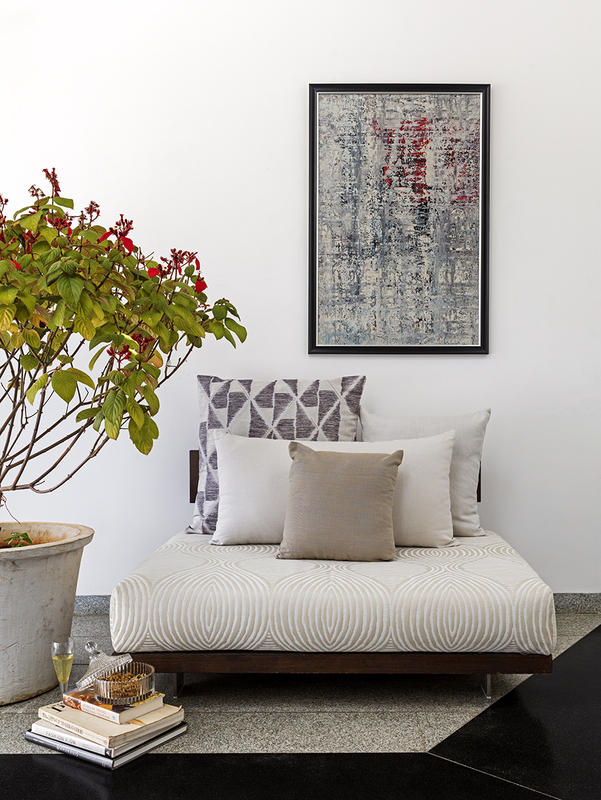 If you’ ae looking to combine several geometric elements, a simpler repeat like Aztec – luxurious yet subtler in terms of the pattern – would be a wonderful addition,” says Abhay Jaipuria, Partner, Vaya Home. Geometric patterns create a subtle contrast that can complement and enhance a colour palette while looking incredibly modern and chic. “Since patterns play such an important role in enriching your space, choosing a certain pattern that will seamlessly work with your interiors is extremely crucial. Choose a pattern that fits within your existing colour scheme, for example, white and brown chevron pattern would work beautifully with shades of dark green. Remember to choose the correct sized print which does not overpower the rest of the interiors as too many different patterns make the space look chaotic and cluttered,” says Parul Mittal, Director, Greenlam Industries Ltd.
Geometric accents are best when used architecturally as a form, using a simple curve but large in wall edges or big rounded edges for furniture usually gives a richer design aesthetic than using geometric accents strictly as a 2D element such as wallpapers. “If geometric design is used in single space, one should use only one geometric accent. Using multiple geometric accents makes the space look confusing and jumbled. If there is only one geometric design, it should be bold and bright as it will be the highlight of the space,” avers Malcolm Daruwalla, Principal Architect, Seedle by DC Group. There are three things to keep in mind while choosing geometric designs namely, colour, variety and furnishing. “Use a specific colour theme and stick on to the respective complementary shades. Don’t go overboard. Use bright, contrasting colours in your patterns to bring the room alive and softer colours like pastels and cool tones for a more peaceful vibe. Don’t limit yourself to plain accents. Try using textures and three-dimensional geometric patterns to add more depth to your interiors. Attempt unique patterns like zig-zags, hexagons, triangular and angled shapes. Finally, never forget the furnishings. If not the walls, you can still experiment with furniture, rugs, cushions, wall accessories and flooring,” says Mahesh Anand, President – Nippon Paint (India) Private Limited (Decorative Division). Geometric accents pair well with classic décor styles as well as contemporary décor. “To infuse the geometric trend in classic décor, look for large, impactful pieces in soft colours. For contemporary settings, both pastels and saturated colours work well for geometric accents. The easiest way to incorporate this trend into your home is with cushion covers and throws over a sofa,” says Nazli Somjee, Design Director, MIMI Homes, Bangalore India. Geometric accents work well with modern, contemporary and minimalist buildings. “The interiors have to be consistent with the building’s architectural aesthetic. Keep the interior lines geometric, free of over decorated surfaces, clean accents and a consistency of simple uncluttered lines,” says Deben Moza, Joint CEO & Executive Director, Project Management Services, Knight Frank India Property Services Pvt. Ltd. Revamping your home is all about ways you can work trends into the spaces slowly curated over the years to make them feel in vogue. “For the perfect dinner party, monotone chairs featuring geometric patterns in bold hues offer a ton of personality in an otherwise a neutral dining setup. Complete the look with a statement geometric centerpiece. 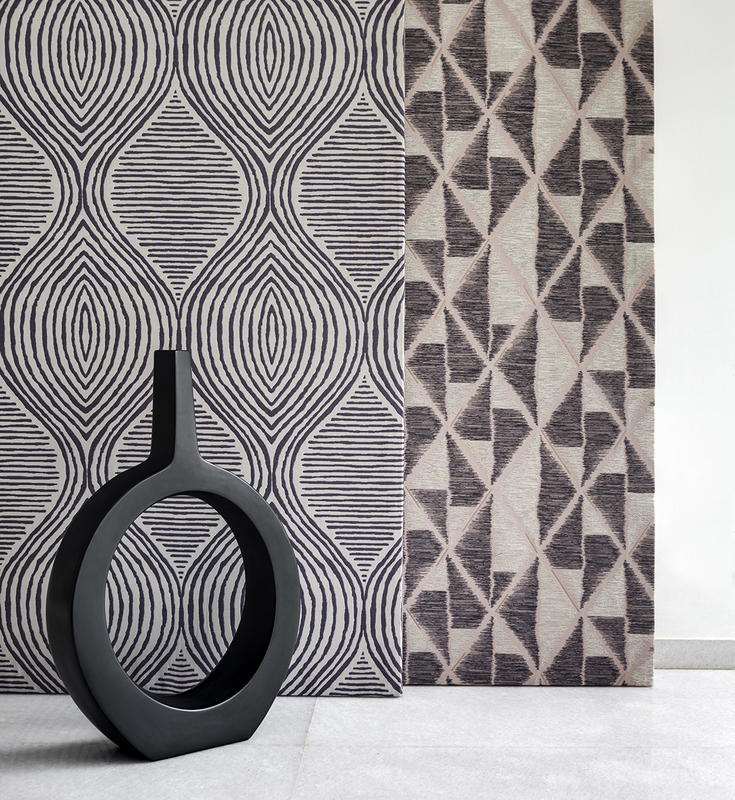 Geometric rugs are trending and can be found in nearly any color scheme and price point. Look for dhurries in bold patterns and colours to add an element of quirk to any space. Give your bedroom a beautiful edge with a geometric headboard adorned in chalky paint; complete this look with cuboid accessory holders, triangular jute lamps and quirky wall hangings in an array of shapes. For a more debonair vibe one can also opt for textured tiles with Bohemian patterns to curate a statement wall in a large room,” explains Arshi Mukri, Design Expert, Pepperfry. So give your home a geometric twist and see the décor magic unfold. Experiment these patterns with other elements of your space, such as a collage of rectangular and square frames with monochrome pictures and pairing it with hints of green plants would give your home a fresh and natural look while making it look elegant and classy. Ensure that geometric accessories do not clash with the other objects in their immediate surroundings which could lead a room to look unplanned. Keep the geometric accent simple and pure, as far as possible use it architecturally as a form. Follow a singular language throughout the space.